Amager Bryghus | Beer Apprentice - Craft Beer News, Reviews, Interviews and Info. Hi guys. For today’s craft beer review I’m going to be trying the Hr. 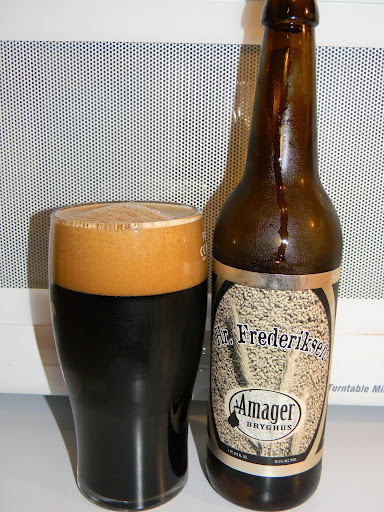 Frederiksen brewed by the Amager Bryghus Brewery located in Kastrup, Denmark. This will be my first time trying this brew. I sort of just picked it up on a whim because I thought the bottle looked pretty cool. The website, amagerbryghus.dk, is written in Dutch, so I will once again refer to ratebeer.com for some kind of commercial description. Even when just poured into the glass, you feel straight away that Mr. Frederiksen is a master of potency and great personality. Pitch-black as Mr. Frederiksen’s humor, this American style Imperial Stout has a dense and creamy, light brown head that leaves an abundance of lacing on the glass as it reluctantly settles. We are happy to admit that we have gone slightly berserk with malt in this beer, eight different varieties were used including black and roasted malts that give this beer its color and almost extreme density – this is almost a meal in a bottle. The bitterness is also supplied by the roasted malts backed by the American Centennial hops. Mr. Frederiksen is an experience to be savoured he should be enjoyed slowly throughout the course of an entire evening where you can warm yourselves by his alcohol and provocative charms. We have named this beer after a good friend without whose wonderful support and assistance Amager Brewery would not be where it is today. Sounds great!!! Let’s try it. This brew comes in a 16.9 oz. bottle and it has an ABV of 10.5%. It poured jet black with only the most faint ruby highlights shown at the bottom of the glass when held directly toward the light. The crown was tan in color and of very good size. It was creamy, smooth and soft. The retention time was excellent and the lacing was both thick and clingy. The beer looked great to be honest. The nose presented a very nice aroma of roasted malt. Rich espresso combined with some hints of dark chocolate and burnt grain. A slight tone of smoke and anise too. Some alcohol was noticed, however it seemed to be very relaxed and only complimented the overall profile. As the brew warmed a touch I began to notice a very mellow essence of dark fruit. Just enough to add a bit of sweetness. This is a very nice smelling beer I must say. The taste was heavily roasted with rich, dark chocolate tones and espresso beans. A bit of “char” and smoke combined with burnt malts and grain to created a very earthy and “woody” kind of taste. The dark fruits seemed even more relaxed and a good tickle of bitterness was had with each and every sip. I also stumbled upon a bit of licorice and leather as I held the liquid on the palate for a few moments. A sturdy punch of alcohol couldn’t be denied and, like the aroma, it only added to the exceptional taste of this brew. A remarkable flavor with this one. The mouthfeel was medium to mostly full bodied. It was very smooth, creamy, chewy and viscous. A beautiful warmth was felt as the brew made its way down the throat and into the belly. A great dose of flavor was left for contemplation after each sip also. Man, this was an excellent beer. It was bold, rich and good till the last drop. It represented the style almost to a “T”. I sure am glad I picked up a bottle and tried it because otherwise I may have not known what I was missing. It’s a perfect “warmer” beer and the drinkability was extraordinary even though it is a “sipper”. I had absolutely no trouble finishing this bottle. I would definitely recommend giving it a try if you happen to see it. I think I may pick up another bottle or two of the Hr. Frederiksen and put them back for awhile. I could easily see myself downing one of these as I watched the snow fall next Winter. Have any of you guys ever tried this beer? What did you think of it? Feel free to leave a comment if you wish and tell me all about it. Thanks for reading everyone. Until next time. Cheers.